Is your property located in a Heritage Area? Click to find out. Owners of properties in any Heritage Area must obtain heritage approval for exterior alterations to their property, new construction or demolition. It is highly recommended that you receive approval and your building permit prior to purchasing or ordering any materials, as there are restrictions that may affect your proposed renovations and your plans may have to be altered to meet these requirements. The heritage approval is part of your building permit application and is completed by City staff once you make an application and prior to releasing your building permit. Any conditions will be stated as part of your building permit approval. Whether you are replacing your siding, changing your windows or building an accessory building, you must obtain a building permit for this work. All applications are received and permits issued at the Access St. John's Customer Service Centre, first foor, City Hall. Routine maintenance and minor repairs that do not change the appearance of the property. Re-roofing in a material that is similar to the existing material. Repairs to or replacement of eavestroughs and downspouts. Re-pointing and repairs to masonry. The goal within the Heritage Area is to maintain or replicate the architectural design elements on your dwelling and to bring it back to it’s original facade, or to improve on it’s current appearance by meeting the Heritage Area Requirements. This will improve the look of your home and also increase the value of your property and other properties in the general area. Copy of your property survey showing the location of your dwelling on the property. A detailed description of the proposed work including location and sizes of proposed windows. Building elevations (views of exterior) showing the proposed changes. If major renovations or extensions are proposed, construction drawings (floor plans and details) will be required. If you have current or old photos of your property please include those with your application. Windows to be single hung unless other styles are approved by the heritage officer. Width of windows to be approximately half the height. Windows and doors to have wide trims installed. One by four inch trims to be installed on top and sides. Two by two inch sills to be installed at the bottom. Sill trim to extend to the outer edges of the side trims and be angled to shed water. Six inch corner board trims to be installed. Siding to be four inch exposure. Please note that vinyl siding is not permitted in Heritage Area One. 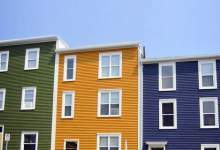 Please note that if wood siding is being installed, it must have a second plane of protection as required by the National Building Code of Canada. Wood siding to be installed on vertical furring strips with a minimum thickness of 3/8”. Exterior handrail and guard to have its vertical members installed between top and bottom rail. Face nailed balustrades typical of new home construction is not acceptable within the heritage areas. No unfinished pressure treated wood at front of building or visible from a flanking street. Pressure treated wood to be painted or stained with solid color stain. Any change to a designated heritage building is to be approved by the Build Heritage Experts Pannel and Council. Please refer to the List of Designated Heritage Builidngs.